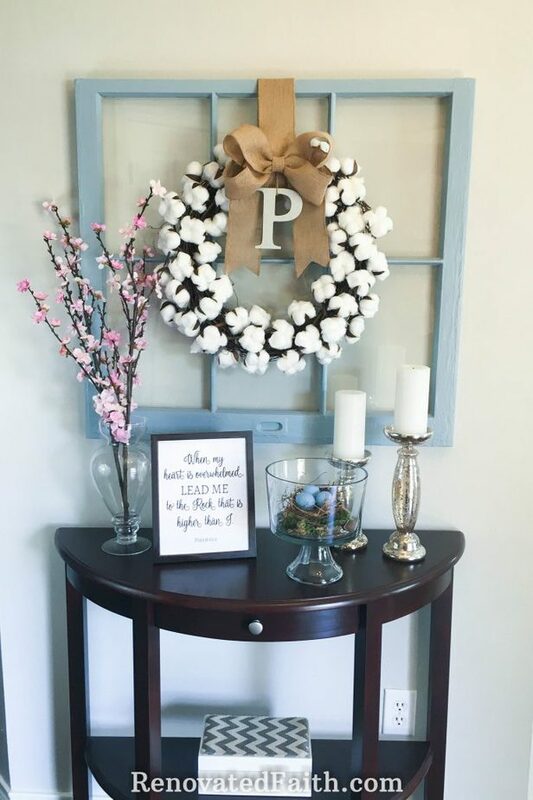 My DIY Cotton Wreath wasn’t only inexpensive and easy to make, but I love how it works for any season of the year. 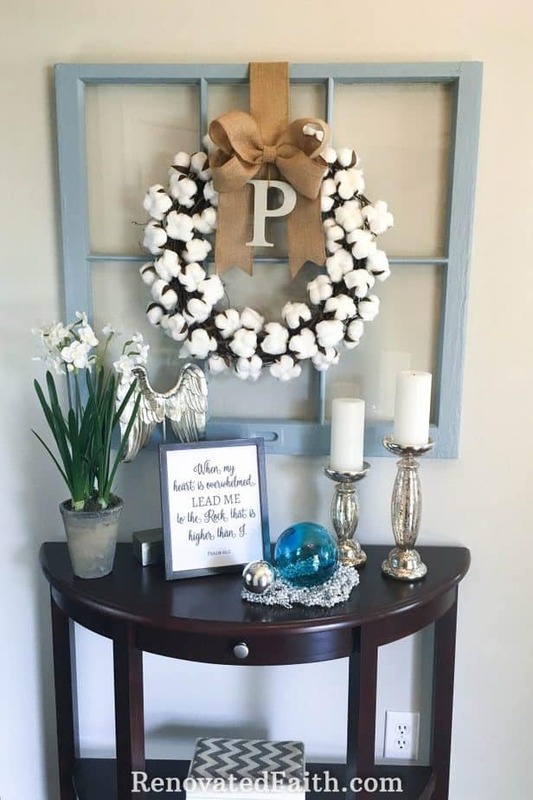 For this post, I decorated my entry table for each season to illustrate its versatility. During the process, I realized that the wreath wasn’t the only constant in these changing scenes. 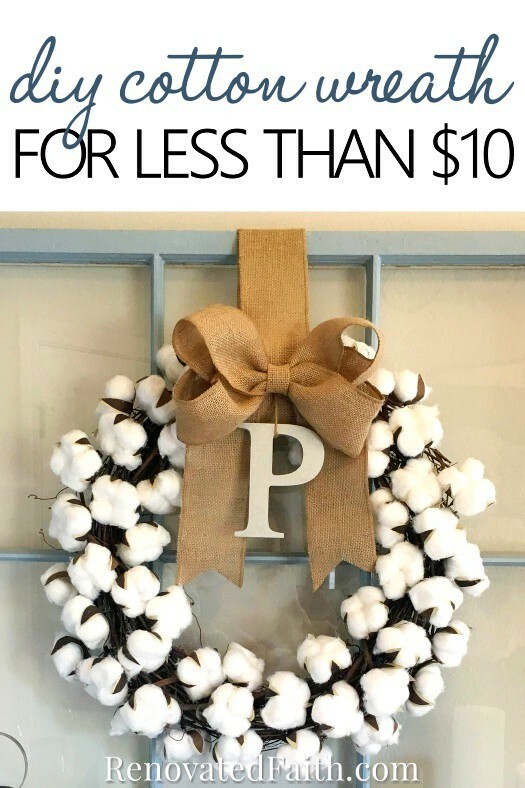 I’d love to share more with you about what I discovered in my post Easy, DIY Cotton Wreath for Less Than $10. 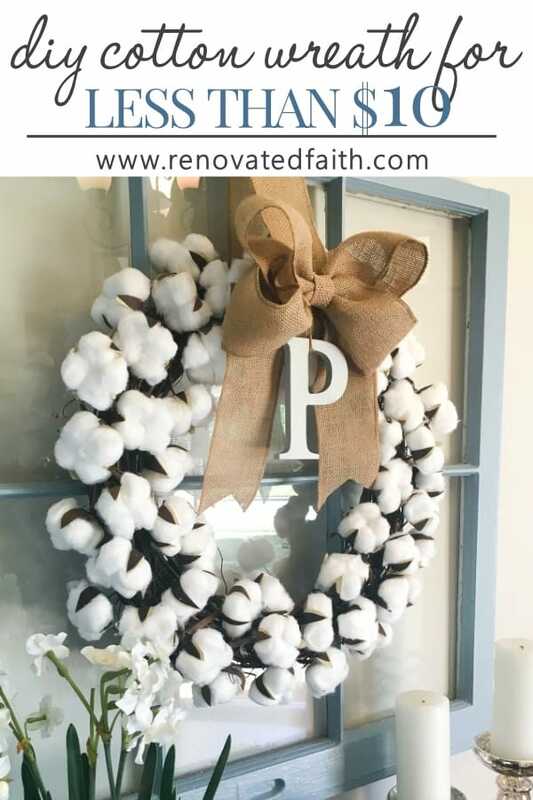 When I made the DIY Cotton Stem Tutorial, I decided the same process can be used to make a wreath for my entry way. 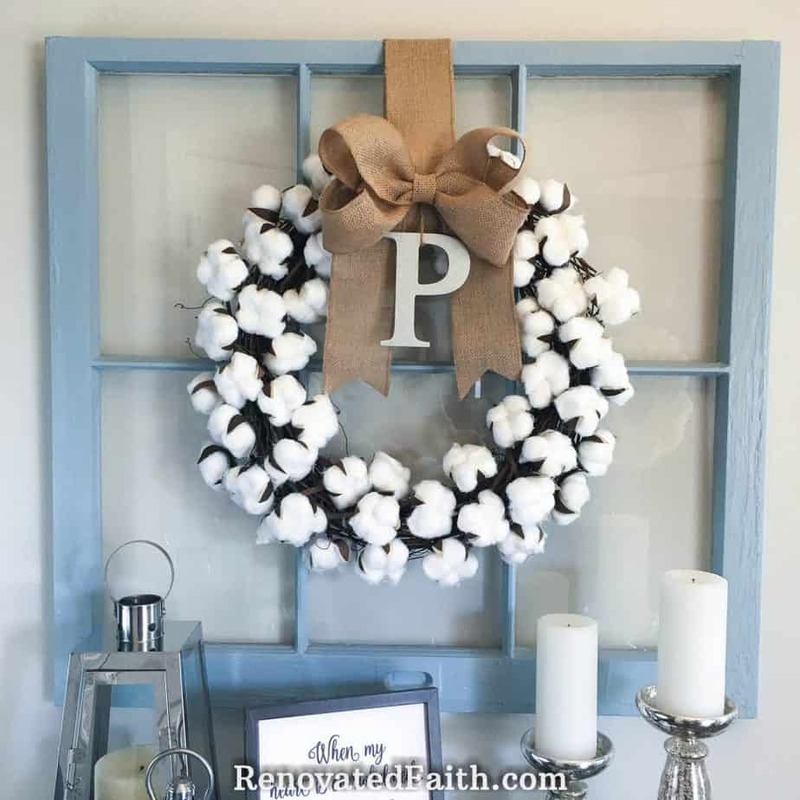 After eyeing several cotton wreaths online, I knew I wanted one that was very full and covered in cotton bolls instead of the scraggly ones you sometimes see. Go big or go home, right? (FYI – the fluffy grouping of cotton at the end of the stem is called a cotton boll). 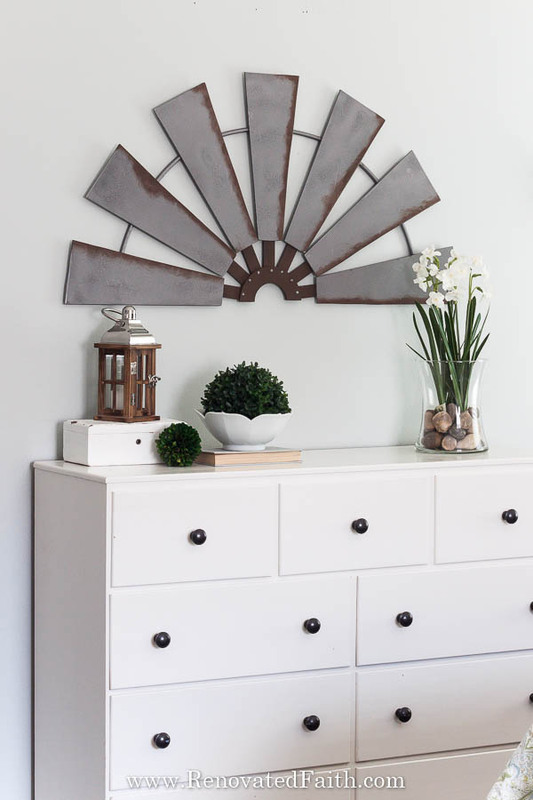 I love THIS one from Magnolia Market but wanted a cheaper option as it would have been $67.00 after shipping. Also, making one allowed me to add some details of my own, as you see below. Hairspray – THIS is what I used but any will work. 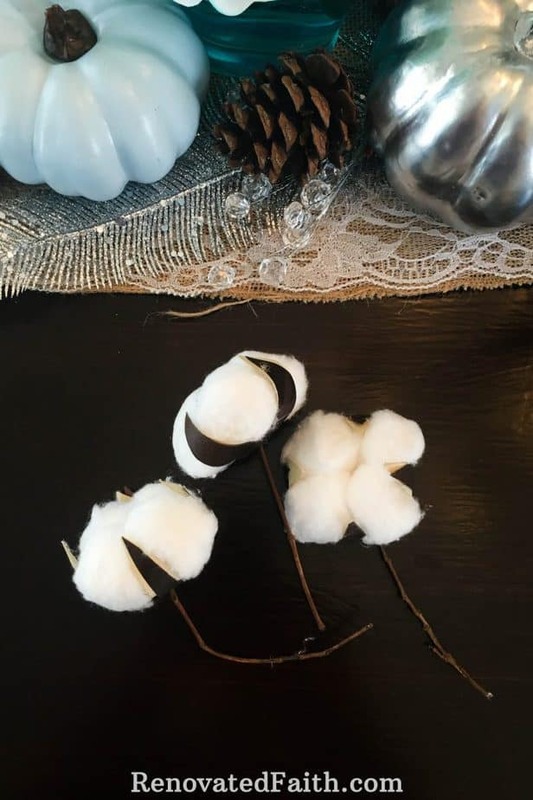 Cut 3″ twigs from your wreath to use as stems for the cotton bolls. The thinner the better. 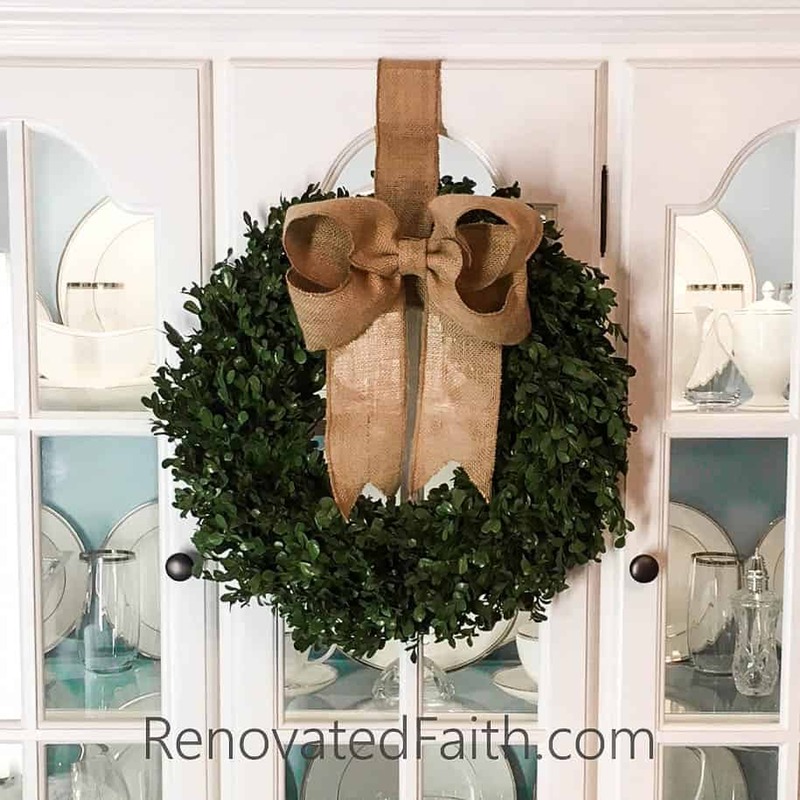 Your wreath will be so full when you are done, you won’t even know they are missing. You can also use small sticks from outside but I was just too lazy to go out and find some. 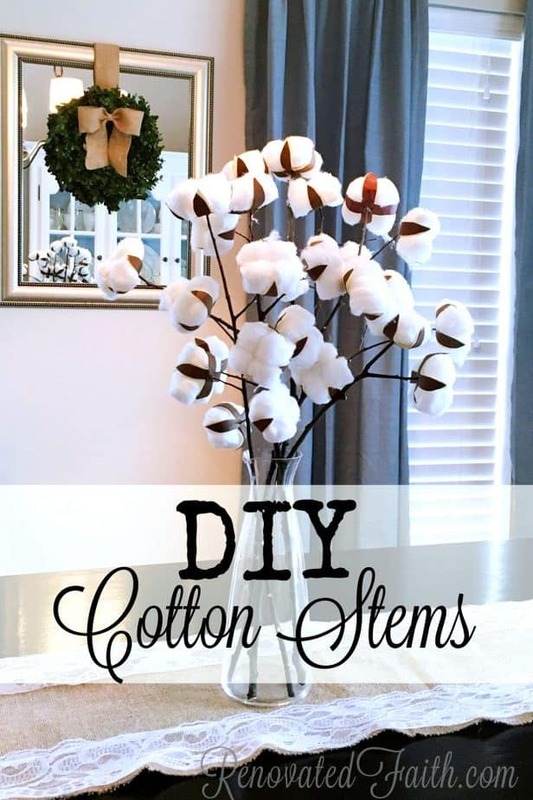 Go to my tutorial for my DIY Cotton Stems and follow those directions except use the 3″ twigs for your branches. I made about 45 for my wreath. 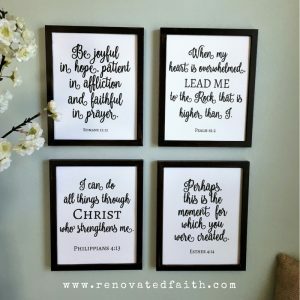 I almost got through one Hallmark movie and I was done! 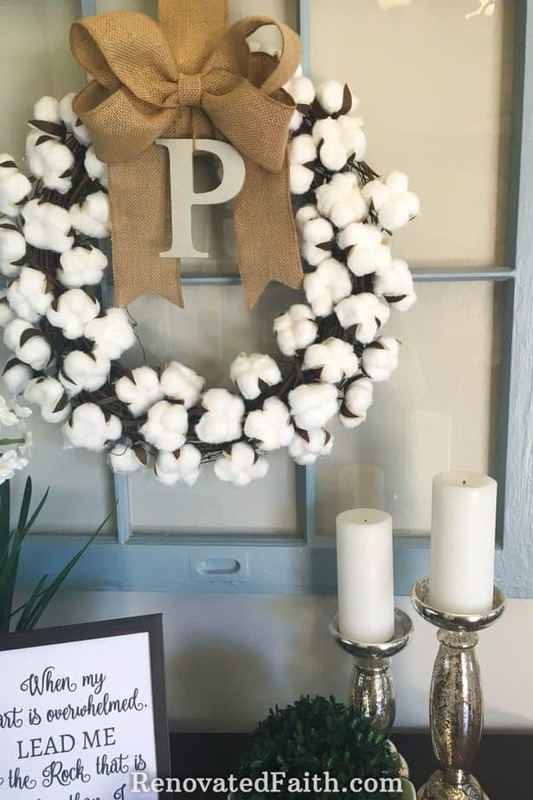 Now that you have made all your cotton bolls, it’s now time to attach them to your wreath. Below you can see the cotton bolls with short stems and part of my Thanksgiving Tablescape with Blue Pumpkins. 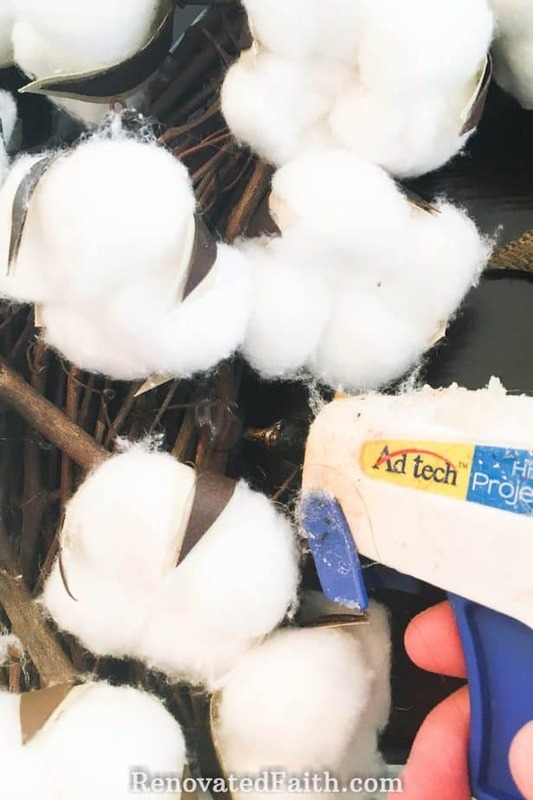 Add each cotton boll to the wreath with hot glue like so, making sure they all lean slightly towards one direction. You will eventually cover the hot glued portions with the tops of other cotton bolls. Now, use the burlap wire ribbon to make a bow using my Burlap Bow Tutorial. I painted my initial with Satin Nickel spray paint to look like galvanized metal. Let it dry overnight before adding it to your wreath. And you’re done! I had a few things on hand so the wreath actually cost me less than $5.00. Hard to believe right?!? 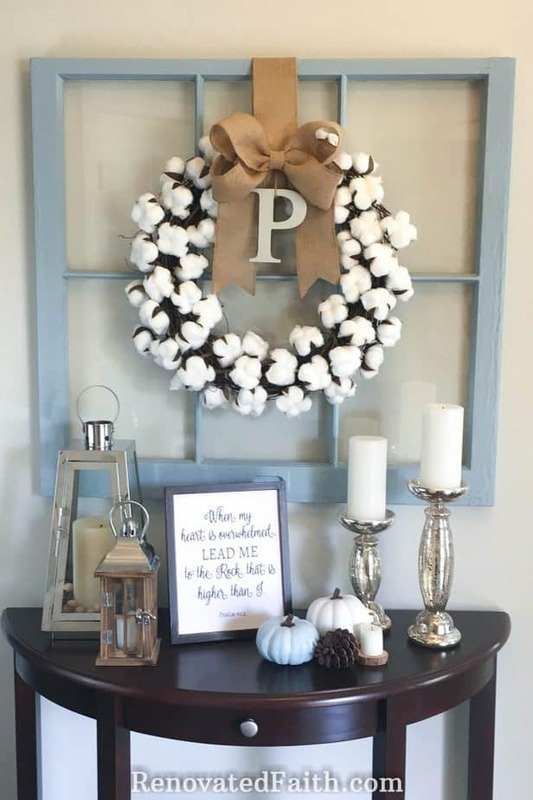 As I mentioned, cotton wreaths work for any season of the year. I switched out a few decor items on my entry table to show a different look for every season. 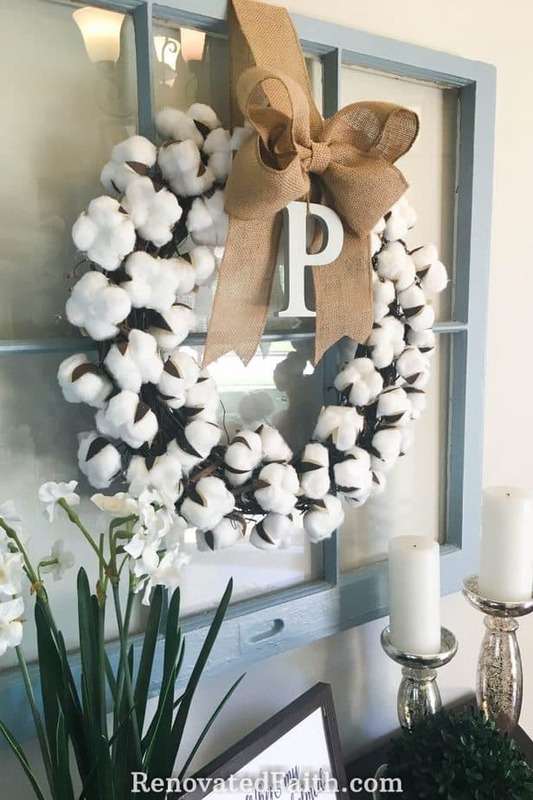 As I mentioned in my post, Why You Struggle To Rest, my grandmother worked on the family cotton farm when she was little so having a cotton wreath in my home year-round reminds me of her. 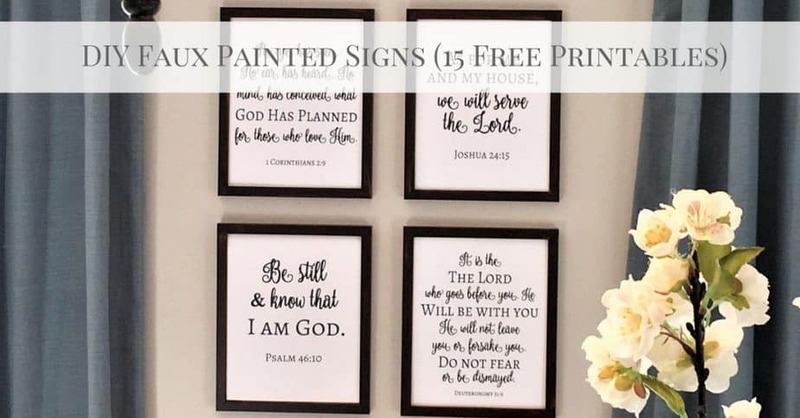 I realized that the one constant through these different scenes was not just the wreath but in what Psalm 61:2 tells us. Even when seasons change, God is our one true source of help. He patiently waits to hear our cries so He can lead us to safety from our troubles. King David prayed this prayer, knowing he could not find strength within himself or his position, but only as an heir of the true King. Like David, Daniel was also a Jewish man of high position who cried out for God in desperation and trust. In Daniel 9, we find him reading the prophecy of Jeremiah only to realize that the 70 years of Babylonian exile for him and his people would soon be over. There was only one problem. Most of the Jews were still living in the same sin that caused them to be exiled in the first place. Daniel was known for keeping his cool in tough situations. When his friends were thrown in the fiery furnace and even when he had to spend the night in a den of hungry lions, he kept calm as he trusted on God. But this time, Daniel hit his needs in a cry of desperation to His God. “Now, therefore, O our God, listen to the prayer of your servant and to his pleas for mercy, and for your own sake, O Lord, make your face to shine upon your sanctuary, which is desolate, O my God, incline your ear and hear. Open your eyes and see our desolation, and the city that is called by your name. For we do not present our pleas before you because of our righteousness, but because of your great mercy. O Lord, hear; O Lord, forgive. O Lord, pay attention and act. Delay not, for your own sake, O my God, because your city and your people are called by your name.” Daniel 9:17-19. Basically, Daniel’s heart was overwhelmed by this sin of his people and he desperately cried out to the Lord for mercy on their behalf. Did you catch that??? At the instant that Daniel started his prayer, Gabriel came “in swift flight” and his plea for deliverance was heard. 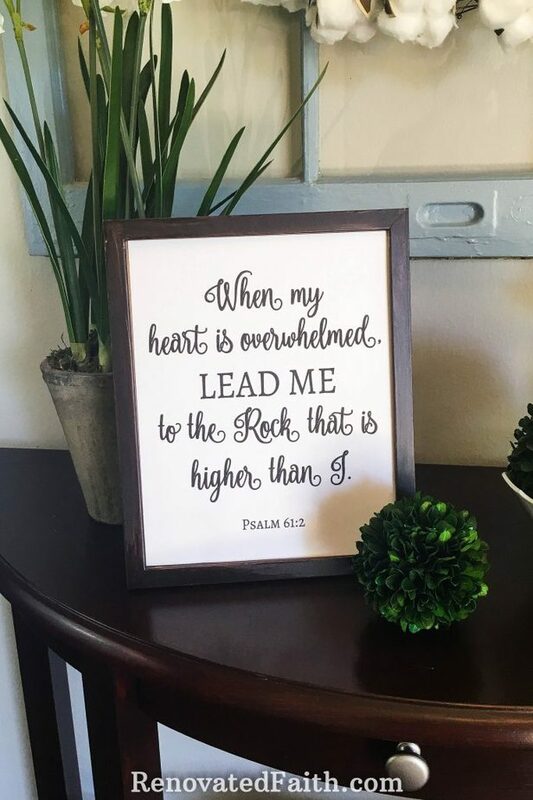 Our cries to God are never delayed or muted, but through prayer we have real-time access to the only One who can rescue us from all our troubles. Our prayers are not snail-mailed across the galaxy to a spiritual distribution center. They are not sorted and stamped in accordance with their level of holiness. Instead, the second we say a prayer, no matter how seemingly insignificant it may be, it is heard in the very presence of God. Revelation 5:8 tells us that our prayers are like incense. Imagine your prayers instantaneously lifting up into the throne room of God as a sweet aroma to Him. As we step into the inevitable craziness that this holiday season brings, know that your prayers are heard every time they are uttered. They are not only heard but they are received with the open arms of a Father who loves His child dearly! He is not only our salvation in the storm but He is higher, stronger and more fulfilling than anything else that claims to save us. So no matter the season, no matter what mess you find yourself in, remember your Heavenly Father is anxious to hear from you. In that same moment, God is already working to answer the prayers of His beloved saints. Did you like this post? This blog is my ministry so be sure to share it as a message of God’s hope. Have a wonderful Thanksgiving!